Chloe Nofziger of Archbold with a free kick that set up the goal for the Bluestreaks Saturday versus Liberty Center in a Division III district final. They will next take on Lima Central Catholic in a regional semifinal contest tonight at 7 p.m.
Kalyn Baker of Archbold drives the ball upfield Saturday against Liberty Center. 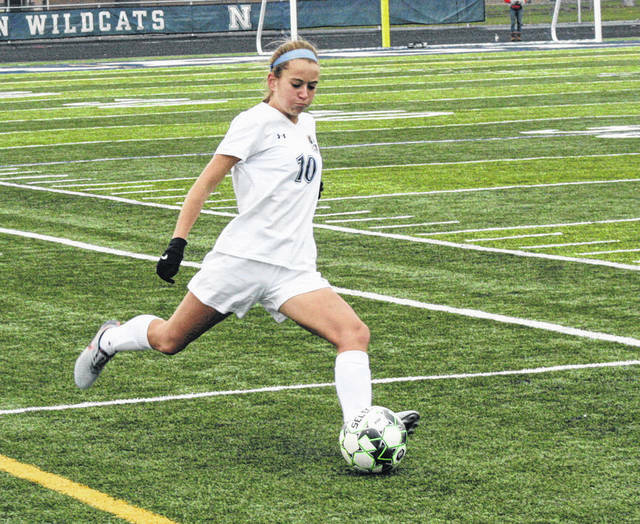 NAPOLEON – Archbold put the pressure on in the second half, eventually finding the back of the net with 32 minutes to play for a 1-0 win over Liberty Center in a Division III girls soccer district final Saturday in Napoleon. It is the second straight district title for the Bluestreaks, and in the process they were able to avenge a regular season loss to the Tigers which gave them the Northwest Ohio Athletic League title. “It was such a great game the first time we played during the season, and honestly could have gone either way,” said Archbold assistant coach Jennifer Kidder. “I feel like we have had, hit, after hit, after hit all season long. With just so many different things. And they just wanted it today. Archbold had several chances prior to the go-ahead goal in the second half. With 36:40 remaining, Archbold’s Addison Moyer got a touch off a Chloe Nofziger free kick but Liberty Center goalkeeper Riley Miller was there for the save. Just over a minute later on a Nofziger corner kick, Moyer redirected it to Kalyn Baker whose attempt was unsuccessful. Keeping with that same theme, Nofziger was awarded a free kick near the sideline at the 32 minute mark. Miller would punch out the initial kick, however, Natalee Rose scored on the rebound to break the scoreless tie. In the first half, the Tigers had some opportunities that were turned away. Samantha Engler received an entry pass and her header was grabbed by Bluestreak keeper Reagan Kohler at the 16:26 mark. Then, on a Jillian Hoffman free kick with 7:32 left in the half, she had the line on the shot from 15 yards away but it sailed over the net. Archbold is happy to be making a return trip to the regional tournament, where they will take on Lima Central Catholic tonight at 7 p.m. back at Napoleon. The winner faces either Eastwood or Liberty-Benton. “I think in 15 years of coaching, (head coach) James (Kidder) and I, we haven’t had a year quite like this,” said the Archbold assistant. “This (going back to regionals) is just the icing on the cake right now. 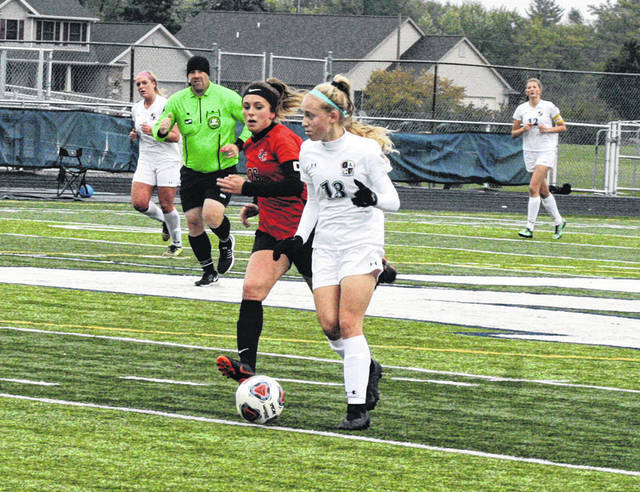 A nine minute span in the second half was the difference in the game as Archbold soared past Evergreen 4-1 in the district semifinal Wednesday at Napoleon. Stuck in a 1-all game, the Streaks broke through for three goals for the win. With 25:03 left to play, Dakota Stamm was the recipient of an open net when the Evergreen keeper came out of the net. She added the final goal with 14:14 left when she ran in off the corner and fired a shot. In between, Regan Ramirez converted a turnover into a goal to make the score 3-1 in favor of the Streaks. Evergreen got out of trouble right away, when keeper Myra Kuszmaul knocked away a point-blank shot 15 seconds into the contest. Archbold was able to get the first goal of the game. Stamm broke through for the first of her three goals to give the Streaks a 1-0 lead with 29:06 left in the half. The game stayed that way until Evergreen’s Asia Gensch put one in just below the crossbar from 30-plus yards off a free kick with 16.2 seconds left in the half. Archbold outshot Evergreen 12-7 in the contest. The Vikings finished the year with a 10-5-1 record.